Holiday Guest Hand Towel. Size: 16 x 25 inches. Embroidered, 100% Cotton. Peking Handicraft Inc. Handcrafted quality handcrafted linens for the home, home fashions, holiday celebrations, entertaining and more. Size: 16 x 25 inches. 100% Cotton. By Peking Handicraft Inc. Handcrafted quality handcrafted linens for the home, home fashions, holiday celebrations, entertaining and more. 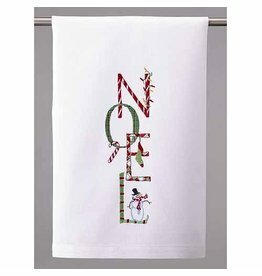 Christmas How To Celebrate Xmas Kitchen Towel Artist Sally Eckman Size: 18x25 inches. 100% Cotton. Peking Handicraft Inc. Handcrafted quality handcrafted linens for the home, home fashions, holiday celebrations, entertaining and more. Noel Kitchen Towel. Size: 16 x 25 inches. 100% Cotton. By Peking Handicraft Inc. Handcrafted quality handcrafted linens for the home, home fashions, holiday celebrations, entertaining and more.